Sorry K, shirtless picture doesn't count if it's the old tubby David. Sorry. I prefer real beef over the steroid I injected crap. MUAH! Their definition of "cub" is really different from what I've become accustomed to. Cole Hamels? Tall and scrawny Hamels is not even close to a cub, and they have him at No. 2. All of the rest of the guys could probably comfortably fall somewhere into the bear/cub spectrum. All are hot guys though, which appears to be their only requirement for the cub designation. It also looks like they made an attempt at diversity. I look forward to your eventual MLB list, Kenneth! 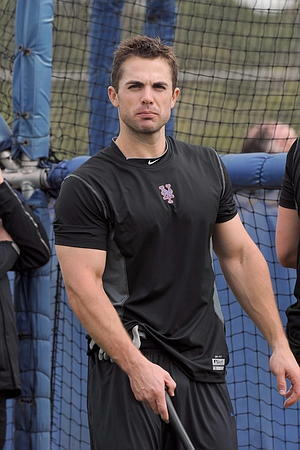 Mr Wright is one of the best looking men in baseball.